The public's demand for aesthetic tooth colored (metal free) restorations (fillings) together with the dental profession's desire to preserve as much natural tooth structure as possible has led to the development of special “adhesive” tooth colored restorations. And this demand is not limited to front teeth. It is now clearly established that a new Biomimetic Approach (bio – life, mimetic – mimicking) to dentistry is possible through the structured use of tooth-like materials such as composite resins and porcelains. Scientific studies and clinical experience have validated their use as both safe and predictable. These changes have significantly impacted upon the way modern dentistry is practiced. Indeed, we may have even entered the so-called “post-amalgam era.” These techniques are also suitable for children's teeth and can incorporate fluoride to reduce decay rates. This article will review this evolution and the process that has led to the development of materials that bond successfully to the building blocks of the teeth, enamel and dentin. Properly restored teeth not only function and wear normally under biting forces, but also look indistinguishable from natural teeth. 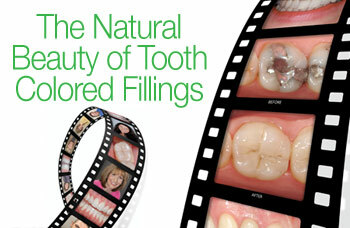 Properly restored teeth function and wear normally, appearing indistinguishable from natural teeth. Teeth through their unique combination of nature's materials constitute a perfect compromise between strength and resilience. This is interesting because these two materials, enamel and dentin, while in some ways are quite similar are also very different. Enamel which forms the outer hard shell covering (the crown) of a tooth, is arguably the hardest substance produced by animals in nature. Made of very densely packed crystals of calcium (hydroxyapatite), it is this crystalline structure that provides its hardness, brilliance and translucent properties, as well as its resistance to wear. 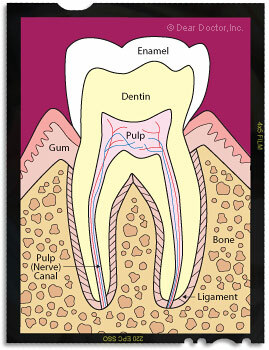 Once formed, enamel is quite inert since there is no living tissue within it. Most of the properties of enamel are mimicked quite well by dental porcelains. Porcelains are a form of ceramic, inorganic non-metallic materials formed by the action of heat. Dental porcelains are made in many colors and shades; they are manufactured in a powder form corresponding to the primary colors of basic tooth structure which is mixed with water and then placed in an oven for “firing” — hence their ceramic nature. These porcelains when built up in layers can be made to exactly mimic the natural translucency, staining and contours of tooth enamel. By contrast the inner core of the tooth and root are made of dentin which has a more porous nature, and is similar to bone. Dentin has a tubular structure, microscopic tubes made of a protein called “collagen” on to which calcium crystals are deposited. Through the living dentin, sensation is transmitted via nerve tissue in the pulp, a central chamber in the middle of the tooth. Dental composite resins are the most common material used for tooth colored adhesive restorations today and have properties similar to dentin. They consist of “resin” – plastic (methacrylate, a commonly used plastic) and “fillers” made of silica (a form of glass). The fillers give the composites wear resistance and translucency (see-through properties).